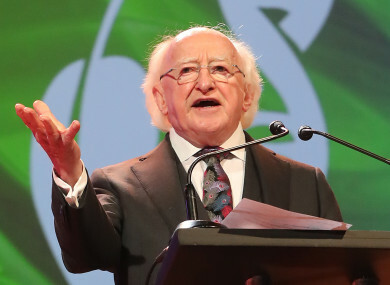 TWO NEW OPINION polls show that incumbent Michael D Higgins is on course for a second term as President of Ireland. Higgins has consistently been in the lead throughout the campaign and these polls – from Behaviour & Attitudes for the Sunday Times and Sunday Business Post RED C poll – suggest that his support is at 69% and 68% respectively. Both polls, however, were conducted earlier this week and may not fully reflect the recent fallout from candidate Peter Casey’s comments about the Travelling community. In the Red C poll, Higgins has a 56 point lead over his nearest challenger Sean Gallagher who is on 12%. Liadh Ní Riada is next on 9%, with Joan Freeman on 6%, Gavin Duffy on 3% and Casey on 2%. This ordering is mirrored in the Behaviour & Attitudes poll with Gallagher second, and Ní Riada third. The nation will go to the polls this Friday to vote in the presidential election, as well as in the blasphemy referendum. Following the furore surrounding Casey, he told the Sunday Independent today that he was “more determined than ever” to remain in the race after taking the weekend off from campaigning. Regardless of whether he chose to keep campaigning or not, his name would have remained on the ballot in Friday’s vote. Email “Michael D Higgins enjoys commanding lead in latest presidential opinion polls”. Feedback on “Michael D Higgins enjoys commanding lead in latest presidential opinion polls”.